It all seemed so simple after five pints of Stella on a cold Friday night in October last year. Buy a mate’s destroyed 2001CBR600 Sport and then turn it into the track day bike I had been longing for. I had been thinking about a track bike for some time and after looking over some complete disasters that people were selling with a straight face for around £5000, I thought doing it yourself might make a better alternative. I knew the bike was a good one. I knew the owner and the love and attention he had lavished on it before an accident and I was beerily confident. A quick look around the bike on a dark, wet night a week later, a cheque for £800 was handed over and I stuck the bike in the back of a borrowed van. Getting it home was easy – all I had to do then was convince my long-suffering girlfriend the smashed-up, fluid-leaking shed that sat forlornly in the garage was going to be something special and not a complete waste of money. It wasn’t just the bike that was going to need some work – my spanner-wielding was going to need some honing as, until then, the extent of my home mechanics had been restricted to tightening chains and fitting the odd can. Hardly the stuff of epics. Looking at my tool kit I knew I was going to need to spend a bit more money before I could continue. The cheapo set had served me well over the past couple of years of minor home DIY but was clearly not going to cope with a job of this scale. Luckily, I had about £60 of Halfords vouchers left over from my birthday and after hearing good things about its Professional range of tools I spent all of them plus another £40 of cash on a 150-piece tool kit. Going out to the garage for the first of many nights, I soon realised there was far more to this than I had thought. For a start it was bloody freezing and within 25 minutes my hands were completely numb. Another trip to the DIY store and I had a tiny but very effective fan heater to try and lift the temperature. More expense as another £8 was spent and I hadn’t even touched the bike yet. Time to finally start getting the job done. First things first – get rid of all the broken bits. Off came the mangled fairing, radiator, master cylinder, levers, footpegs and bars. It also took a lot of time to salvage the bits that were undamaged – each bit taken off that was still in good shape meant cash back and less money I had to shell out. The full exhaust system was definitely not going out on a track. Neither was the seat unit, taillight, rear indicators or rear footpegs which were all advertised and sold for a grand total of £550. The problems with the bike were clearly not just cosmetic – they hardly could be after previous owner and good mate Chris Butcher unfortunately slid it into the back of a car. Thankfully, he was only slightly hurt but the insurance company took one look at the dented frame and destroyed front end and ticked the box marked " Beyond economic repair. " But now I needed my own assessment of the damage and took it to BSD Developments in Peterborough. They phoned me back with the news I’d hoped wouldn’t come. The frame had more bends than an Alpine pass and the forks were banana-shaped. Magic! First up was rebuilding the forks because they have to be straight before the frame can be put in a jig and bent straight. A few calls around scrap dealers proved only one thing – there were no other scrapped CBR600 Sport models around at that time. But the breakers I rang said they’d be sure to get some soon, which was a bit worrying. A call to a local Honda dealer proved to be worthwhile because they listened to the list of parts I needed and said they could do a deal on a bulk buy. I also had the reassurance that none of it was from anywhere other than a completely legitimate source. I ordered the stanchions, radiator, and top and bottom yokes, getting the lot for around £680. Taking into account the £520 I got back from salvaged bits, I wasn’t doing too badly. With Christmas looming I managed to convince my girlfriend the only thing I wanted was bits for the bike. She bought me a set of bodywork from Race Products which arrived in the biggest box in the world. It would have taken 50 rolls of wrapping paper to cover, so she didn’t bother. The bike looked a very sorry sight at this time and I was out of cash for a while. A week’s holiday was spent at home and I just had to sit there and clean what was there. And wait until I got paid again. As soon as February’s cash came in I was straight out to buy a new chain, Renthal sprockets, Carbone Lorraine SBK compound brake pads and some HEL braided brake lines, plus a set of super-sticky Metzeler Rennsport tyres which are identical apart from the tread pattern to the Pirelli Super Corsas I have used and loved before. In my job as MCN’s World Superbike reporter I had seen these parts in action and knew they suited the CBR600 in competition, so I was sure they’d be perfect for track day use. The lack of progress was starting to get to me and there was only one solution. I went out with a credit card and came home with a full, stainless steel Micron race exhaust, which was relatively expensive at £720 but is one of the easiest ways of tuning a CBR600 without touching the engine. It was at about at this time that MCN’s publishing editor Adam Duckworth bought his race Yamaha R1 so we were constantly chatting about what was happening with each other’s bikes. The first place he took his to was RGS in Wellingborough, Northants. I had taken previous bikes to them and always been impressed. A call to the boss Gary Ward was all it took for him to take on project CBR600 as well as Adam’s R1. Considering Gary races, fettles (and wins a lot) in his own 1996 Jordan Formula One car in the BOSS F1 series, I have no doubt working on the CBR is a breeze for him. Gary also owns one of the most incredible road-going Ducati 916SPSs I have ever seen and has an attention to detail that would embarrass a trainspotter. Around the middle of April the CBR and a box load of bits were delivered – all I needed was a front brake master cylinder, throttle assembly, clutch lever, clip-ons and sundry bits to tidy it up. I also needed the bodywork sprayed up because no matter how nice a bike is prepared, in plain white it just looks like a rat-bike. Gary’s mates at Extreme Paint were his first choice – conveniently, they were doing Adam’s R1 and are based on the same industrial estate. I couldn’t afford anything flash, but even with two colours I was gobsmacked when I saw the result. The red is flawless, the number boards perfectly placed, the black bellypan so beautifully understated and the graphics the right side of subtle. They even filled a dent in the tank in and sprayed it over. Gary entrusted the work on the bike to his main two-wheeled tweaker Alan Smallwood, who did all of the work in record time. RGS started life in the car trade but bikes are now nearly as big a part of its business and growing heartily. Alan traced a new master cylinder and brake lever from a written-off Honda Super Blackbird, got a new front wheel spindle that had somehow gone astray, fitted Harris clip-on handlebars, stuck the Hel brake lines on and got rid of the sidestand and switch. Good mate and fellow bike nut Stuart Robinson from AEM Engineering, which makes F1 components, happened to wander over to see how Gary’s F1 car rebuild was going and ended up making a new aluminium undertray for the tailpiece which looks superb. He also brought some anodised pre-load adjuster bolts for the top of the front forks which makes tweaking the suspension so much easier. It’s this attention to detail that makes a bike look better than average and is worth the extra expense. Then Alan sorted out the electrics, stripping out all the unnecessary wiring for the lights, the horn and indicators. 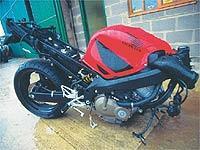 He also completely race prepared the bike, including drilling and lock wiring the sump. Then all that remained was to tidy it all up so it was showroom fresh. Seeing the bike for the first time in a complete and sorted form was an experience I will never forget. Imagine losing £100 on a big night out with the lads, then the next morning dipping your hand into the beer-stinking jacket you wore the night before and finding it again. Multiply that feeling by about 50 and you approach the emotions tumbling though my brain as I hopped around the RGS workshops, grinning like a maniac and touching the bike over and over. After six months of waiting it was all done, for a total of a little over £3700, including the £800 I spent on the bike. Take out the £550 for bits sold, the bodywork, which was a gift, and the cost is even lower. If I’d been able to source secondhand parts like the yokes and radiator, I probably could have nudged it in at less than £3000. Buying the same bike without the crash damage would set you back at least £5000 for a privately bought 2001 CBR600 Sport, and the same for the parts to turn it into a track bike. When I think how much I was ready to part with for one of the seriously secondhand 1998 CBR600s I had seen at the end of last year’s race season it makes me feel even better. Doing a lot of the work yourself is a part of it and working on a bike with your own (often bruised and bloody) hands creates a bond between man and machine that never ends. I can’t see myself getting rid of the bike for a long while yet but I’ll still be able to get my money back when I do. In the meantime I’ve got a load of track days to get organised – time to give the CBR600 the caning I have been dreaming of since that moment of beered-up clarity way back in October.